Capella Kincheloe is an interior designer whose advice and expertise has helped other designers design and build their businesses. She shares her knowledge with both trade professionals and consumers via her website, capellakincheloe.com. To kick off our Designer Spotlight series, which highlights designers and other innovators in the design industry, we thought we’d ask Capella a few questions about her business, success as a designer, and of course, her favorite KWA carpets. If there was one piece of advice you could give up-and-coming designers, what would it be? I think being transparent is a big part of that; your clients are hiring you to work for them and to be on their side, to be their champion. I wrote an article about this titled “Do You Work for Your Clients?” because I see some designers forgetting who hired them. Lastly, be really clear with how you run your business. You want your pricing, your systems, and your processes to be super clear because most issues come from some form of miscommunication (and thus, unmet expectations) in the pipeline. Comfortable and natural. I want a room to feel inviting and cozy, with nothing superflous. I like bringing in different cultures from around the world and always a bit of nature. How are interior design trends different in Atlanta vs. Arizona? I have been in the design industry in Los Angeles, Atlanta, and Phoenix and they are all so different! Just like local culture is different, so is people’s style. Atlanta design is more refined; it is generally more formal and subdued. There is a rich tradition of home-keeping in the South that even younger people want to maintain in their homes. Entertaining is different in Atlanta and houses reflect that. Here in Arizona, we live outside a lot more and people romanticize the West, so you see a lot of traditional southwestern design here, even if it isn’t as trendy as it once was. I think design in both places has gotten a bit of a shake-up in the past 5 years or so. 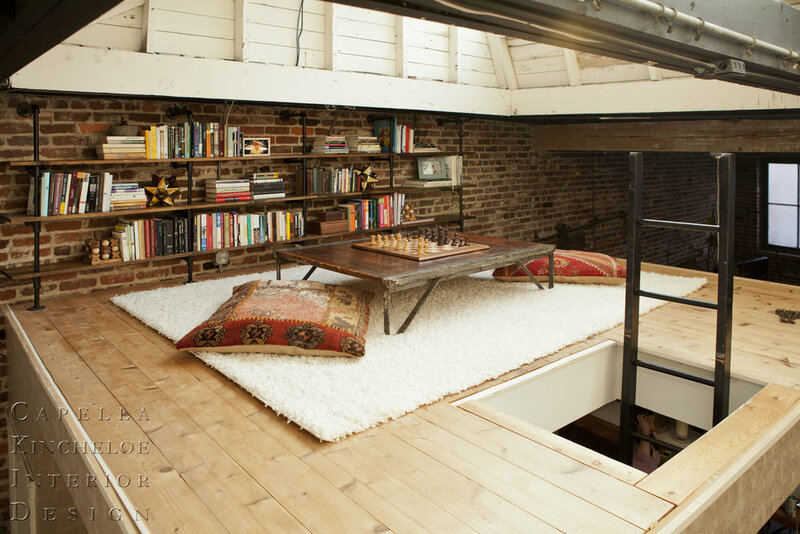 What would your dream space look like? My dream space is a room filled with books, with a window that looks out onto mountains and a comfy chair. What’s most important to you when it comes to shopping for rugs? What do you gravitate toward? Rugs are some of the first things I shop for – it’s a great jumping off point for scheming a room and coordinating fabrics. I always go for worn rugs. I prefer rugs to be as low profile as possible. I like them with a little character, that looks like they have a rich history and have graced floors halfway around the world. I don’t mind rugs that have some wear – the holes and threadbareness just make them more interesting to me! 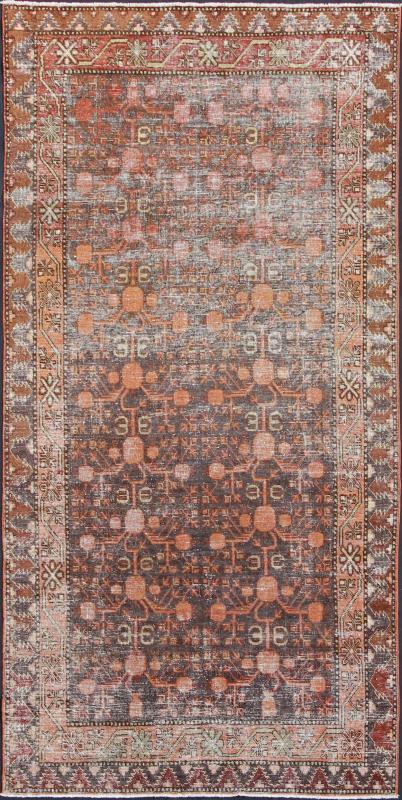 When shopping for rugs, I would say I just get a feeling about which rug is right – much of design is like that for me. 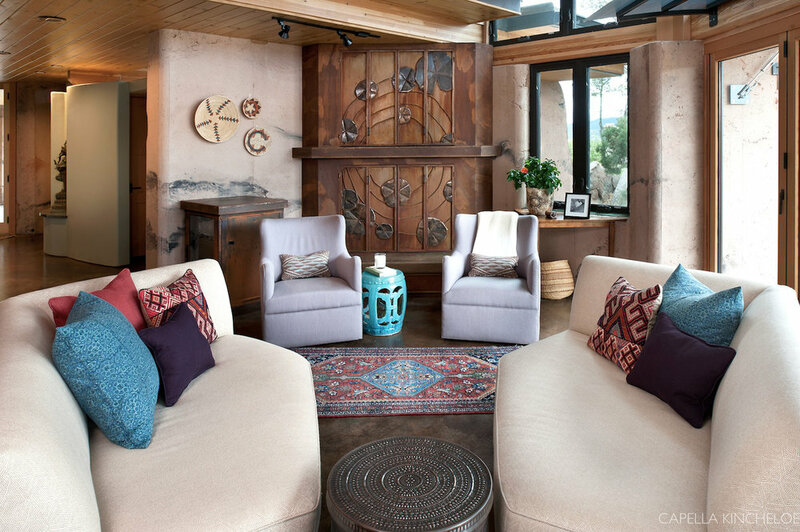 Likely, it is simply the experience of looking at thousands of rugs and the instantaneous clicking of my taste, the client’s taste, the room requirements, their lifestyle, into that moment where it “feels” right. What are your Top 3 KWA picks? 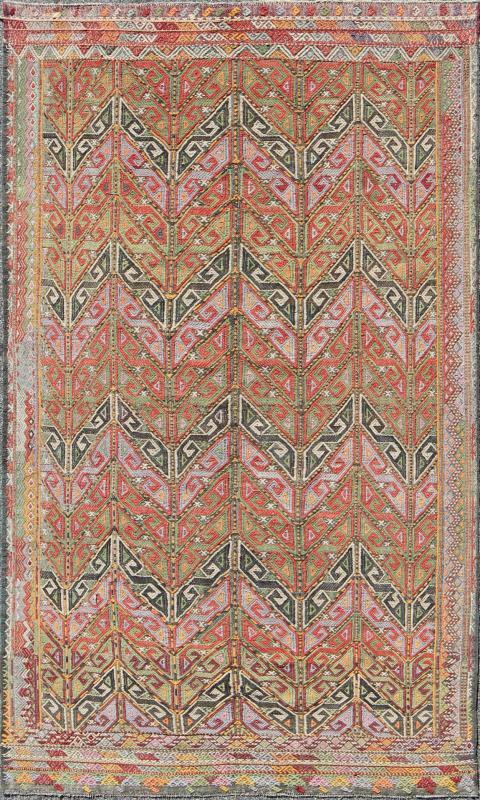 Turkish Oushak Runner with Multi-Medallions and Tribal Motifs in Brown and Red: This Turkish Oushak runner features a multi-medallion design as well as patterns of smaller tribal motifs. Colors include dark brown, muted red, and cream. Turkish Oushaks are notable for the grand, monumental scale of their designs, often in subdued color palettes. The rugs’ qualities are enhanced by their particularly soft and lustrous wool. Antique Khotan Carpet: This piece is an antique, early 20th Century, central Asian Khotan rug with a traditional, all-over pomegranate pattern on a charcoal field surrounded by multiple complementary floral borders. Vintage Embroidered Kilim Jajeem Rug: Set on a multicolored background, this geometric Kilim Jajeem bears a large-scale repeating pattern. Colors include an array of gold, light green, pink, light blue, charcoal, red, yellow, orange and ivory. Capella’s work has been featured in numerous publications, including Atlanta Homes & Lifestyles, HGTV Magazine, and Better Homes and Gardens. 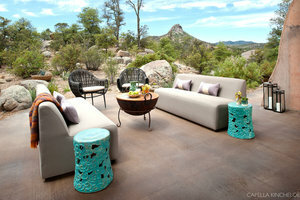 She also offers a free mini-course in business training for interior designers. Leave your questions about Capella and her work in the comments below. And click here to visit Capella’s website to learn more. Keivan Woven Arts Stars in The Hunger Games! Copyright © 2013 Eyesonnet.com | Keivan Woven Arts, Atlanta GA - Keivan Woven Arts. All Rights Reserved.